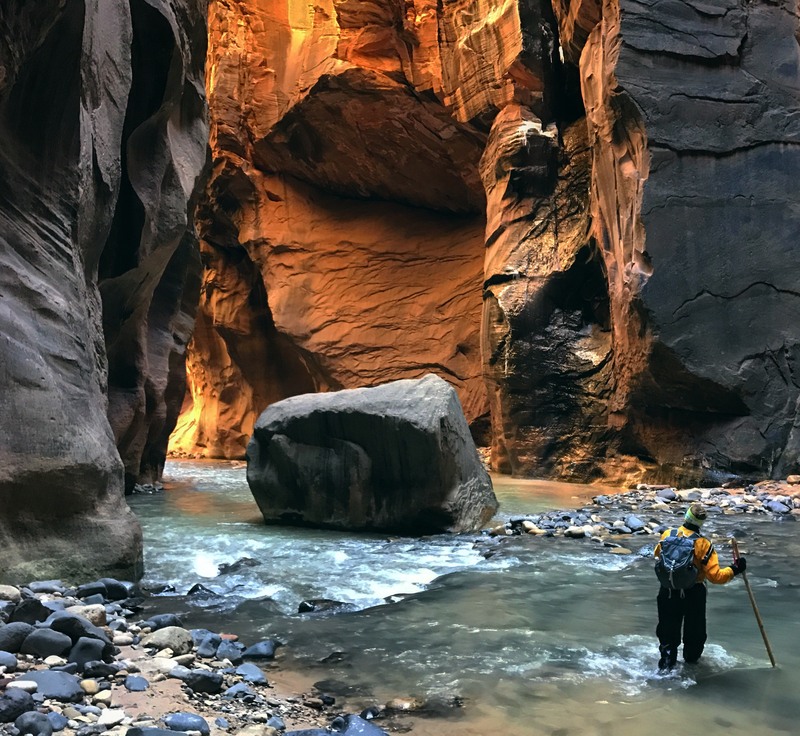 Situated in Utah’s Zion National Park, The Narrows Top-Down route is one of the most spectacular short hikes in the United States. Stretching some 25 km (16 miles) from Chamberlain’s Ranch to Temple of Sinawava, it follows the course of the Virgin River through the northern reaches of Zion Canyon. At times the chasm is up to 600 meters (1,968 ft) deep and only six meters (20 ft) wide, and much of the walking is done in water that is regularly at shin height and occasionally above. If you don’t like getting your feet wet, do not read any further. I hiked the Top-Down route in 2013. All details have been updated as of April, 2017. A special thanks to Steven “Twinkle” Shattuck for giving permission to use some of his great photos! Difficulty: Easy overnighter or moderate day hike. 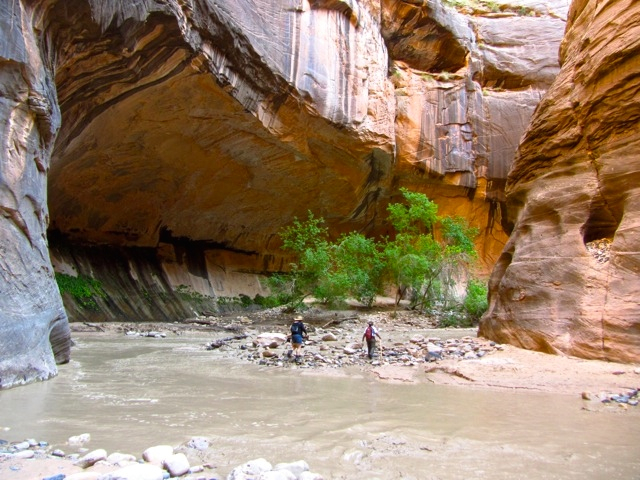 Northern Terminus: Chamberlain’s Ranch is situated 1.5 hrs drive from Zion Canyon. To get there you have two options: private transport or shuttle bus company. 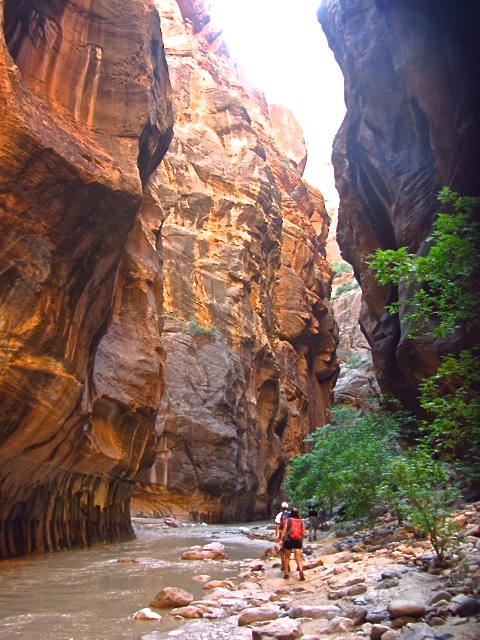 For the former, check the Zion National Park website for directional details. In regards to the latter, google “shuttles to chamberlains ranch / the narrows“, and multiple options will appear. Note that the road to Chamberlain’s may not passable in wet conditions for normal vehicles, and access in winter is limited due to the snow. Southern Terminus: Access is much simpler at hike’s end, thanks to the regular shuttle buses which run through Zion Canyon between April and October. The main hiking season is between June and October. Between March and May the hike is often closed because of rising water levels due to spring snowmelt. During the winter months water temps can be nippy, possibly necessitating the use of a wetsuit or even a drysuit. Irrespective of the time of the year, check on the latest conditions with Park Rangers before setting out. This particularly holds true between mid-summer to early fall, when there is a higher possibility of flash floods occurring. In short, don’t do this hike if heavy rain is on the meteorological cards. Photo from Steven Shattuck | The Narrows, 2017. Permit: Whether day hiking or overnighting (see below), a permit is required to hike the Top-Down route. Permits applications can be made online at the Zion National Park website. 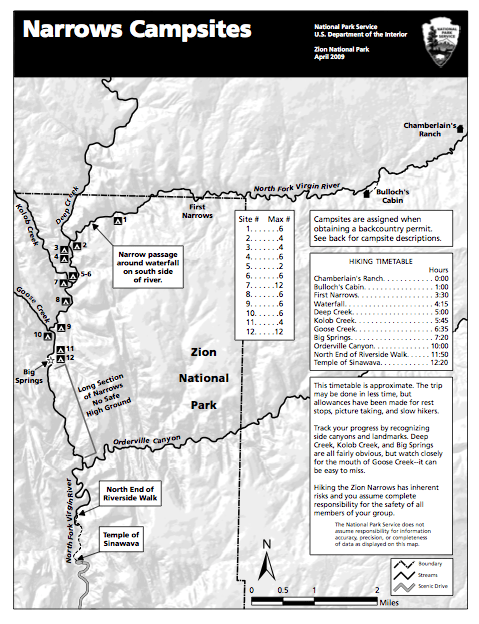 Maps: The basic Zion National Park map available at the Visitor’s Center should suffice for navigation purposes. Alternatively you can download it for free from the excellent National Parks Maps website. If your looking for more detail, try the National Geographic Trails Illustrated map for Zion National Park. Food & Water: Bring all your food and water. The latter suggestion probably sounds a little weird considering you will spend most of the day hiking in shin deep H2O………sort of like bringing sand to the beach. However, water in The Narrows is pretty murky and for the most part not that great for drinking. Corridor of Light | The Narrows, 2013. Route: The Top-Down hike begins at Chamberlain’s Ranch. The first few miles to Bulloch’s cabin are both easy and dry. Soon after passing this landmark the hiker enters the water for the first time. Six miles (10 km) of splishing and splashing later, the route reaches North Fork Falls and the confluence with Deep Creek. This marks the beginning of the most spectacular section of the gorge. From here until the finish, the river is a little deeper and the walls are a lot higher! Terra Firma in The Narrows | 2013. Conditions: Dampish. More than half of the 16 mile distance is spent in water. If you don’t like getting your feet wet, best look elsewhere. Tip 1 – Timing: If you are doing the Top-Down route as a day hike, start as early as possible in order to finish before dark. Tip 2 – Footwear: Leave the waterproof boots at home. Boots are heavier, take longer to dry, and as the water is often at shin height or above, your feet will be soaked regardless of your choice in footwear. Instead of boots, try wearing lightweight trail running shoes with good tread and a solid heel counter. Tip 3 – Balance: A trekking pole can come in handy for balance purposes, as the rocks underneath the river’s surface can sometimes be slippery. 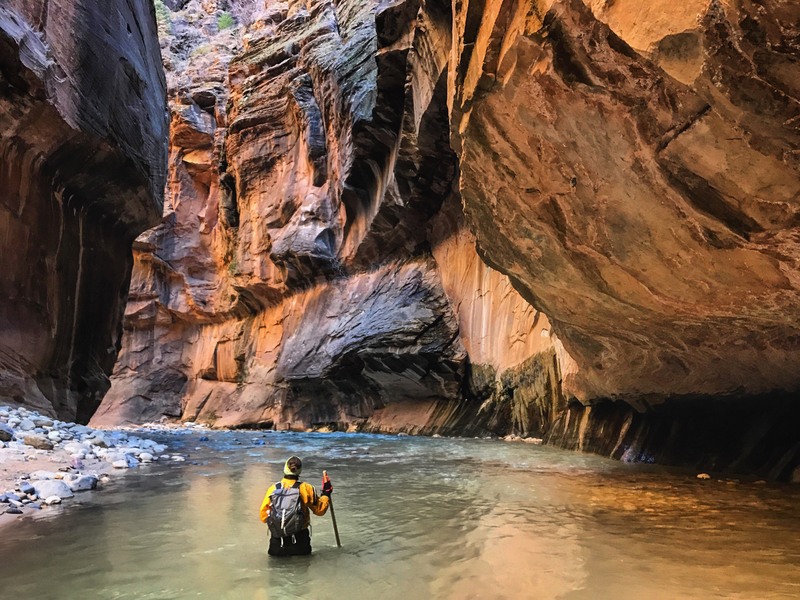 Tip 4 – Clothing: The water in the Narrows is often quite cold, so be sure to bring sufficient clothing layers. This particularly holds true for the early morning hours. Don’t forget to bring gloves and a beanie as well. For those wishing to overnight in The Narrows, camping is possible at one of 12 designated campsites in the gorge. You will need to reserve in advance. A shorter, more popular and easier-to-access alternative to the full descent from Chamberlain’s Ranch, is to take a shuttle bus to the Temple of Sinawava, and from there do an out-and-back hike to Big Springs. It’s a 10 mile (16 km) round trip. 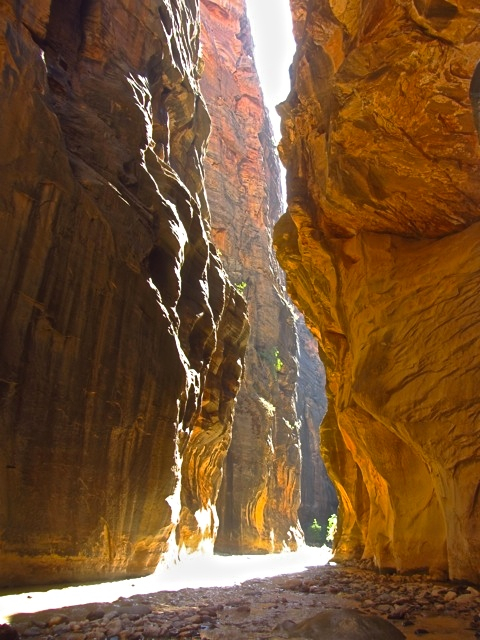 This particular section of “The Narrows” includes the most spectacular part of the gorge. No permit is needed for this hike, and if you start early, chances are you will have the outward journey mostly to yourself. Rounding the Bend | The Narrows, 2013. The “Top Down” route is a spectacular trek that requires no special skills or equipment (except in winter when a dry suit may be advisable). 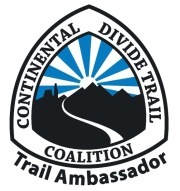 It can be done by hikers of all ages and experience levels. All you need is shoes with good traction and a tolerance for having wet feet for a day or two. When combined with the equally impressive day hike to Angel’s Landing (also accessed via the free Canyon shuttle), it makes for a great “one-two” combination for hiking enthusiasts visiting Zion National Park. 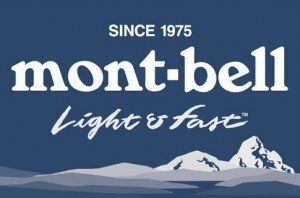 When is a good time to experience with less people and still moderate temps? I suspect that outside of school holidays would be your best bet. It’s also worth noting that the section from Chamberlain’s Ranch to Big Springs receives far less traffic than the stretch immediately south of Big Springs (i.e. Due to all the out-and-backers coming up from the Temple of Sinawava). Back in 1948, my fiancé and I (I was age 18) hiked from Chamberlain’s Ranch through the Narrows, met at the bottom by Will Flanigan, early pioneer and explorer of the area, and members of his family, including my fiancé’s aunt, Nellie Flanigan. 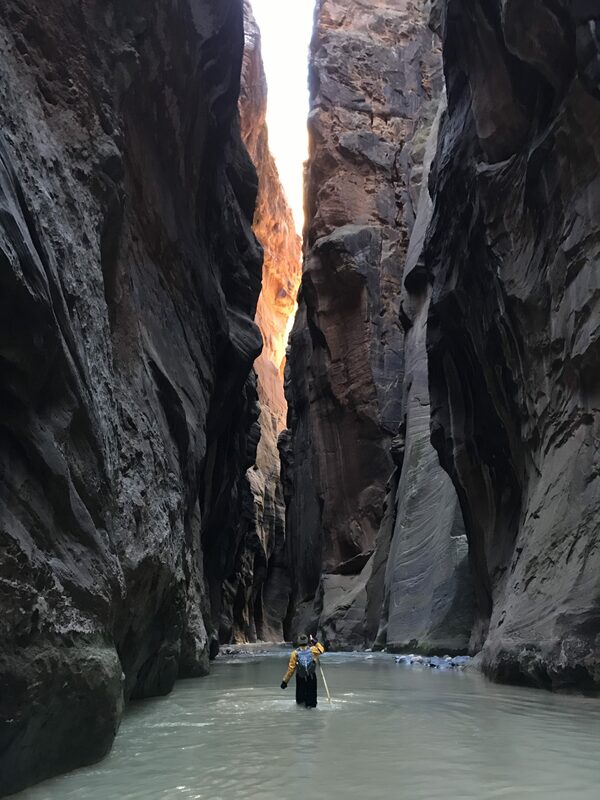 It was Will’s proclamation that I was the first woman to traverse the full length of the Narrows and was reported unchallenged as such in the newspapers. Such a spectacular trip! What a great story! Thank you very much for the message. An amazing feat! I salute you. All my best.